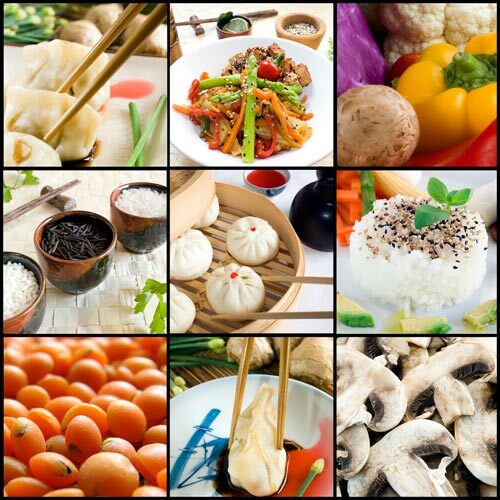 The festival is celebrated on the ninth Chinese lunar month, the Vegetarian Festival in Thailand 2015 is being celebrated from 13th-21st October. During this time, Thailand’s Chinese communities purify their bodies by cutting all meat and dairy out of their diet. The festival is popular throughout Thailand, and especially in areas with large populations of Chinese immigrants, such as Bangkok, Chiang Mai, and Phuket. Many Thai people observe this vegetarian festival, even if they do not eat Thai vegetarian food throughout the rest of the year. 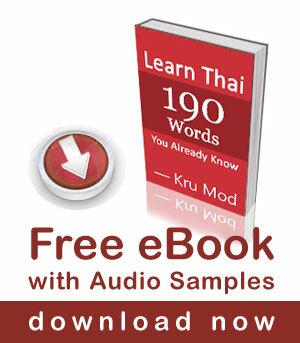 Some Thai people practice Thai vegetarianism every Buddha day (full moon). As I am in Bangkok, I see vegan dishes all over the city from 7-11 to large shopping malls like Central World.You will also spot stickers and signs or yellow and red flags that signal a place is selling vegan food. The best way to enjoy all the delicious vegan cuisine is to just walk through the area surrounding Yaowarat Road and sample small dishes at some of the hundreds of temporary stalls. 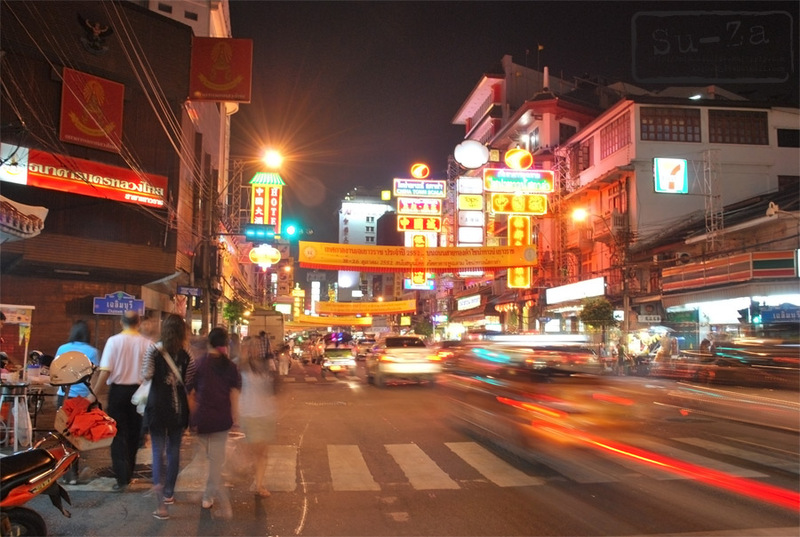 Yaowarat Road is naturally where the center of all the action, particularly in the evenings. The 9-day-9-night event has been held under the concept “Pure Blessings and Auspiciousness for His Majesty the King” to commemorate their Majesties the King and the Queen including Members of the Royal Family. The celebration will commence with a Chinese lion dance, a flower float carrying deity statutes, and a ceremony to select a virgin lady to represent Guan Yin, the Goddess of Mercy. Navigating along Yaowarat Road, local and foreign visitors will be able to experience the mood and taste vegetarian delicacies on offer. The best time to come is early evening, around 17:00, so you can grab a bite to eat. Getting there is fairly easy, take the MRT subway to Hua Lumphong statiob and then either walk for about 15 minutes, pass Wat Traimit and the Chinatown Gate, or grab a taxi or Tuk-Tuk which will cost around 50 baht. 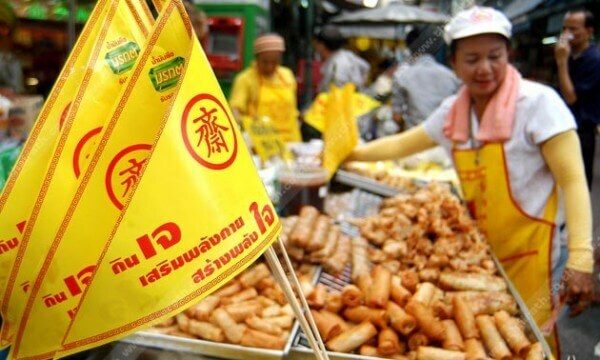 During Vegetarian Festival yellow and red flags that signal a shop or stall is selling food in line with the festival regulations can be seen around Thailand. 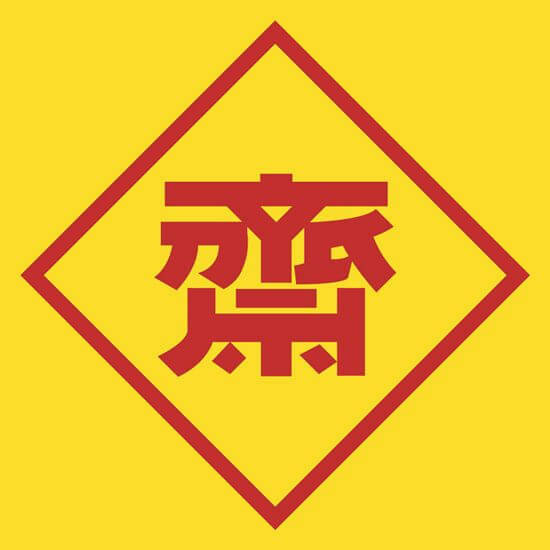 The red Chinese letter on the flag that is read “jay” or “jai” , the meaning of the word is ‘food with no strong smell’. The reason for using red colour is that Chinese people believe that red,corresponding with fire, symbolises good fortune and joy. Yellow, corresponding with earth, is considered the most beautiful and prestigious color. The Chinese saying, Yellow generates Yin and Yang. Yellow also represents people who observe precepts. Phuket is particularly spectacular during the Vegetarian Festival celebrated by Phuket’s Chinese community. Devotees participating as mediums (Rang Song ร่างทรง /râang song/ or Mah Song ม้าทรง /máa song/) bring the nine Taoist emperor gods to earth by entering into a trance state and piercing their cheeks with all manner of objects: sharpened tree branches, spears, slide trombones, daggers. Some even hack their tongues continuously with a saw or axe blade. Those chosen for possession may be men or women, young or old. There are many reasons for a god to choose a particular person. It could be that the person is about to die for some reason and becoming a mah song is a way to extend their life. Or it could be that they have bad karma from an earlier life, and something bad is about to happen that can be averted if they become a mah song. Some people believe that, in some cases, the mah song has some deep historical connection with the god. But whatever the reason, no one can become a mah song without the permission of his or her parents being sought. They believe that the gods skewer the cheeks of the mah song with objects as a way to absorb bad energy, to help other people by freeing them from bad karma, illness or sorrow. Shopkeepers on central streets set up altars in front of their stores, offering incense, fruit, candles, flowers and nine tiny cups of tea to the deities invoked throughout the festival. During the street processions, mediums stop at the altars and pick up the fruit, which they add to the objects piercing their cheeks or pass on to bystanders as a blessing. The mediums also drink one of the nine cups of tea and grab some flowers to stick in their waistbands. The shopkeepers and their families look on with their heads lowered and hands together in a prayer like wâi gesture, out of respect for the mediums and the deities possessing their pierced bodies. 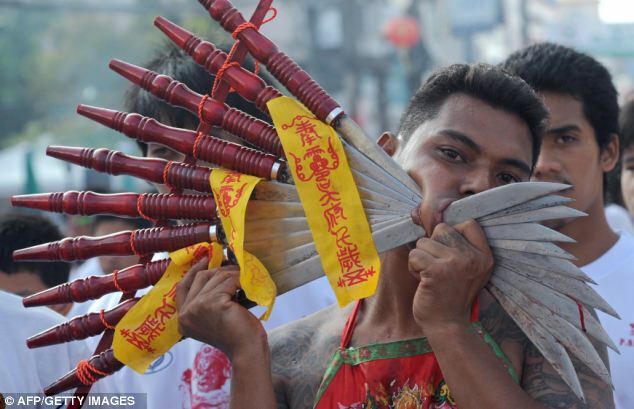 If you want to see this ritual, check out the Phuket Vegetarian Festival. Samut Sakhon: The beachside province of Samut Sakhon boasts a humble yet impressive celebration to mark the annual Vegetarian Festival at its nine sacred Chinese shrines. Visitors can take part in merit making at nine sacred Chinese shrines, opt out of consuming meat and try new flavours from more than 50 shops selling food in line with the festival regulations, at the City Pillar Shrine. Pattaya Vegetarian Food Festival 2015: Another unique place to witness distinctive celebrations of the Chinese descendants in Thailand. Local and international visitors can join the celebration at the Sawang Boriboon Foundation in Na Klua district, about a 30-minute drive from Pattaya city centre. The celebrations include a sacred ritual to make a special vegetarian diet to please the gods. A Chinese deities procession by scores of devotees – all clad in white, will mark the dawn of the celebration, followed by an auspicious communal meal complimented by heavenly peaches for good fortune. 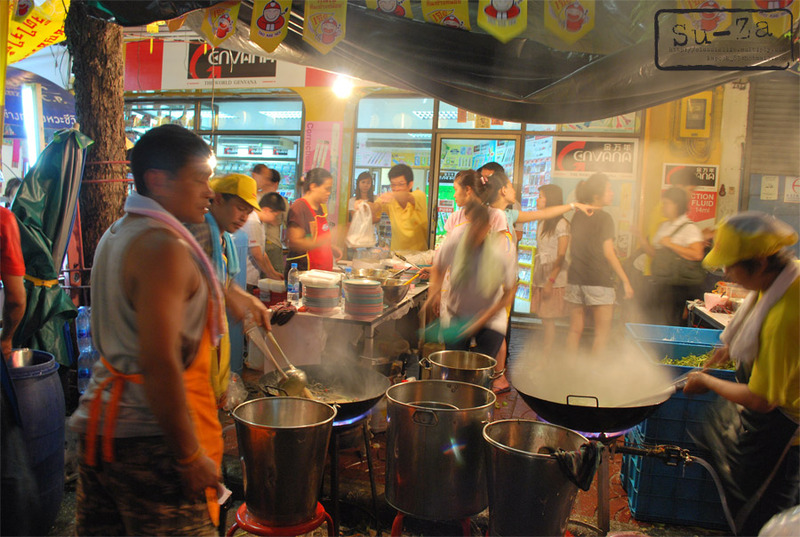 Hat Yai Vegetarian Festival: Known as one of the largest communities of Chinese descendants in Thailand, Hat Yai is also a home to energetics celebrations of the ninth Chinese lunar month. 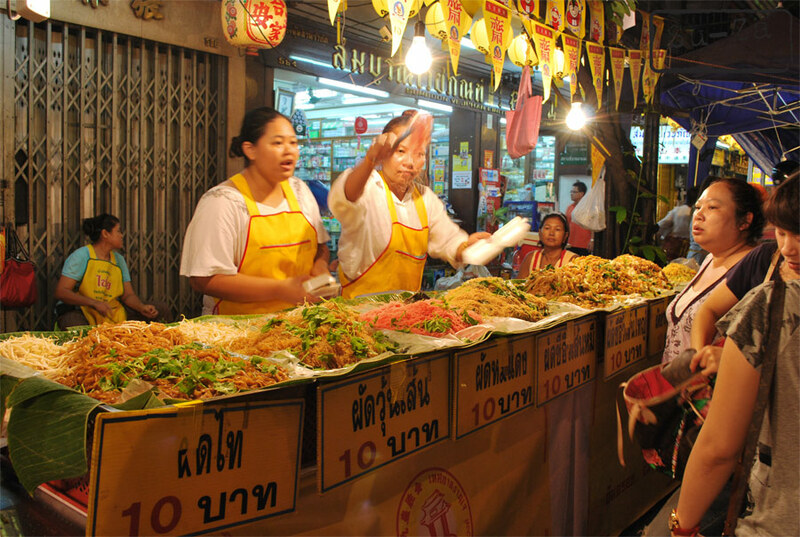 Hat Yai Vegetarian Festival includes worshipping of Chinese Gods to Buddhist monks blessings, and spirit mediums parade to selling of vegetarian delicacies from more than 108 food vendors. Trang Vegetarian Festival: As an international trading seaport, Trang is set to celebrate the vegetarian festival with vegetarian meals, continuous prayer chanting, as well as a wide variety of religious and cultural programmes such as a procession of Chinese Gods, and ceremonies to ward of bad fortune. Ranong Vegetarian Festival: Known as one of the wettest places in Thailand, Ranong benefits from the rainy season that lasts more than eight months with evergreen forest and lush mountainous areas. With influences from the areas Hokkian Chinese descendants, the Ranong Vegetarian Festival and its accompanying sacred rituals are believed to bestow good fortune upon those who religiously observe this rite. Join the nine-day celebration at Tai Tae Eia Shrine, Ranong. Phang-nga Vegetarian Festival: Renowned for its beautiful land, spectacular bay, and amazing islands, Phang Nga celebrates its vegetarian festival from 13-21 October, 2015. Local residents wearing white garments will be able to enjoy vegetarian meals from Chinese shrines in their neighbourhood. Celebrations also include a procession of Chinese deities, and awe-inspiring acts such as walking on fire by spiritual devotees. In case you’re thinking of taking part in the annual cleanse, keep in mind there’s more to it than just cutting out meat and dairy. Read more HERE. And sorry ladies. If you’re pregnant or menstruating, you’re not supposed to take part in any of the ceremonies at the Chinese temples. Who or whom .either she or him u should trial to eat veg is good for health and relax your stomach for no meat day for 9 day only.i enjoy hope same to all. Can you make a vdo on this topic,otherwise we cant learn the speaking manner .Krap jai maak krap. It is commonly known as the “9 emperor gods festival” in Malaysia. As Mod has mentioned it commence on the Ist day of the 9th Chinese Lunar month for 9 days usually. There will be procession to celebrate the festival with all the activities as mentioned by Mod. Bangkok,Phuket in Thailand. 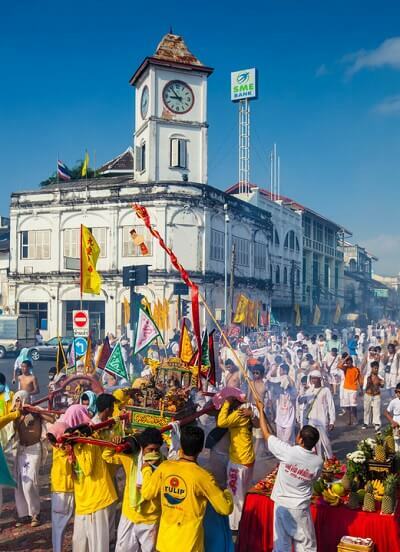 Penang/Ipoh /Kuala Lumpur in Malaysia..this festival is celebrated on a grander scale. When I visit Thailand I must come during that festival!